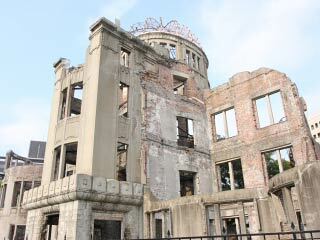 Atomic Bomb Dome (原爆ドーム), aka Genbaku Dome, is the Legacy of Tragedy located in Hiroshima Peace Memorial. It is the monument which presents "Never Forget the tragedy of Atomic Bomb, and never let it happen again." It is designated as UNESCO World Heritage Site. 1. use Hiroshima electrical tramway to Genbakudome mae. This building was built 1915 as the exhibition for products made in Hiroshima. Until WWII, this building was used for also art museum and cultural exhibition which helped development of Hiroshima art and culture. In August 6, American Bomber B-29 dropped Atomic Bomb into Hiroshima city. It killed over 78,000 innocent citizen and wiped out entire city by the explosion. The victims reached about 140,000 dead by the end of the year. This victims are not included death of leukemia and other cause by the radiation. The explosion had several thousands times stronger than the energy of Sunlight with in 0.2 second and the temperature of the grand surface reached 3,000 degree C. The blast wave was over 440m per second, and it's pressure was 35 ton per square meters. Most of the buildings were destroyed by these blast and pressure, but Genbaku Dome was survived. For that unforgettable tragedy, is designated as UNESCO World Heritage site. It is preserved as it happened in August 6.